When the sight of Elvis Presley's gyrating hips made parents in the 1950s fear that rock 'n roll was the gateway to further rebellion, they missed the point entirely. Rock 'n roll didn't cause rebellion; rock 'n roll was the rebellion. And when the art-form is epitomized by a series of scintillating strums on an electric guitar, one realizes that rock 'n roll will be the most seductive rebellion of all. 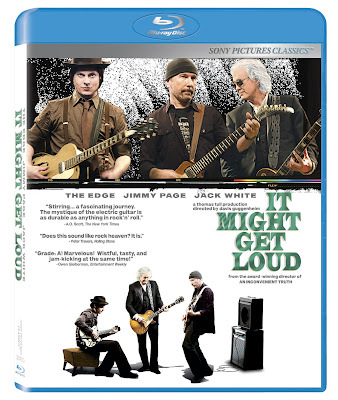 In Oscar winning filmmaker Davis Guggenheim's It Might Get Loud, he focuses on three particular outsiders from different generations and countries that rebelled against the status quo simply by picking up a guitar. 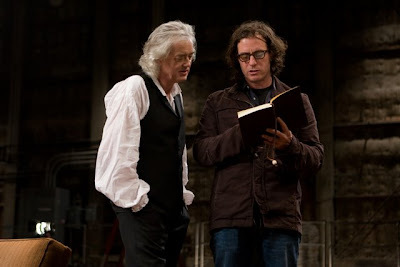 Forgoing the power point presentations of his previous feature length documentary, An Inconvenient Truth, Guggenheim and his extremely talented editor Greg Finton embarked on a rock doc rebellion of their own. Noticeably, It Might Get Loud fails to conform to the genre's two most tried and true structures of putting either a standard concert on film or by delivering a 98 minute episode of VH1 Behind the Music... and it's all the better for it. 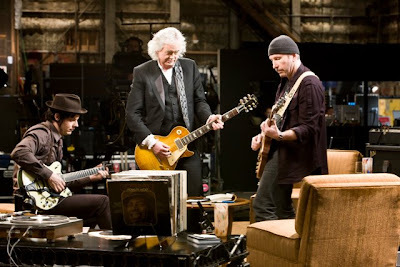 The result is a rare blend of performance, autobiography, interview, and confessional filmmaking as Guggenheim invites us along to dig past the modern day success of Jimmy Page, The Edge and Jack White, both separately and together as they participate in a historical jam and gab session in 2008. 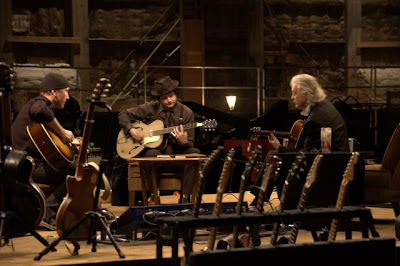 And along with mixing the aforementioned techniques together, the filmmaker establishes a great sense of historical time and place as Guggenheim crafts a powerfully toe-tapping opus that you could almost dub "Portrait of a Guitarist as a Young Man and Legendary Axeman" multiplied by three. 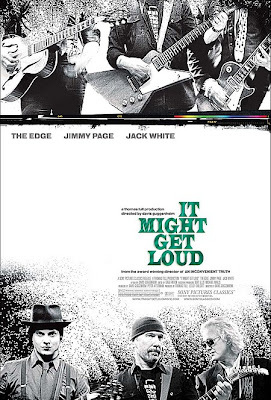 While granted, the amount of footage of the three men from England, Ireland and America actually talking and rocking out is considerably less than the film's trailer would have you believe nor is it as "loud" as the misnomer title claims, nonetheless it's a deeply satisfying and cinematically rhythmic celebration of guitar geekdom and musical passion. Namely, no matter how many songs they've laid down in recording studios, on pieces of paper, or during sound checks, Page, Edge, and White's rebellious revolution will "Ramble On" in pursuit of the next great riff. 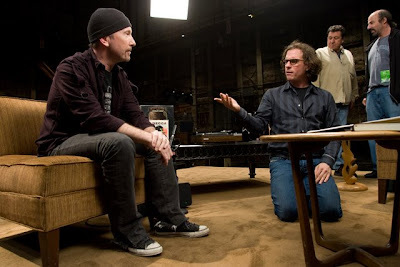 In the words of the mostly quiet Edge-- since the guitar is the musician's voice, he works extra hard to make sure that he's able to duplicate the exact sound he can hear in his head to express it to the audience the same way that singer Bono can do vocally. 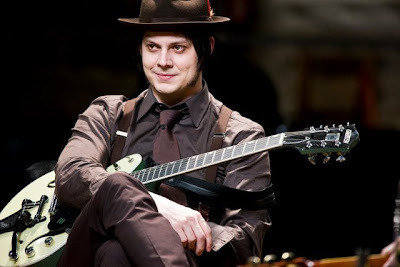 Taking the more technical based search of Edge to a visceral level of playing the guitar until his fingers literally bleed, Jack White uses his knowledge of several instruments as well as his position as front-man to vocally, lyrically, and musically channel the frustrations raging through him into infectious hooks and enviable chord progressions. It's no accident that every one of White's songs sound like a rebellion, for it's the music that produced "Seven Nation Army" after all. Furthermore, as I recently discovered when the hot water turned freezing cold in the shower, White's work ensures you're able to survive getting the shampoo out by shouting along to "Hotel Yorba" until you make it to safety. It's this rebellious nature and constant battle within that defines the individuals who began their lives as: a session guitarist and art school graduate fed up with making Muzak (Page), an Irish student who was lucky just to survive a walk to school without blowing up (Edge), and the youngest of ten children in one of the only white families in Detroit's “Mexican Town” who worked as an upholsterer apprentice (White). Fascinating, inspiring and intimate, we begin the film scratching our heads at The Edge's bizarre version of yoga that replaces tranquil Zen with his BlackBerry before marveling at his technological knowledge. 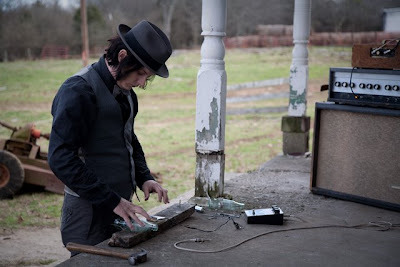 Quickly we discover, his true Zen is the music as he capture sounds and transfers them to buttons, pedals, boxes and more in order to enhance the texture of every single note he plays. 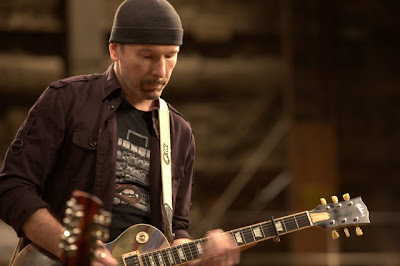 As he shares some of the painful stories of growing up during the endless bombings in Dublin before punk music caught his ear, the fact that Edge wrote lyrics to "Sunday Bloody Sunday" suddenly clicks in your mind as you see in the man, the boy who crafts anthems he wished had been blaring in his country during the '70s. 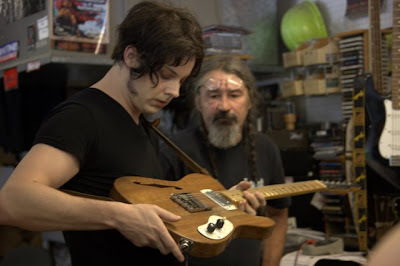 Likewise, it's awe-inspiring to watch the creativity pour out of the prolific White who writes a song on camera before handing it to the filmmaker off-camera, and likewise connects bottles and wires to a board with an amp in his fight to avoid easy over-processed studio noise by replacing it with pure soul. 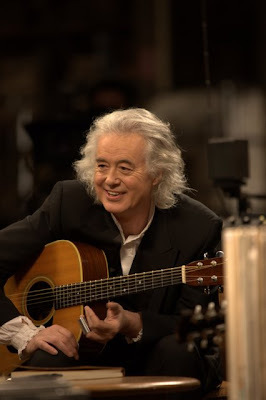 However, classic guitar junkies will most likely be transfixed by Jimmy Page, given his amazing body of work including years spent with the legendary Led Zeppelin. And it's hard not to get goosebumps as we tour one of the band's old recording sites in the form of a gorgeous, vacant estate in the country with wide open spaces and excellent acoustics indoors given the high ceilings and wood for echoes. Yet, as thrilling as it is to see classic footage of the band in their critically misunderstood heyday when music critics summed up their fourth album with a scathing one paragraph review, it was even more exciting to discover just how much of a little boy Page still is at heart. Eagerly sharing the secrets of "Stairway to Heaven" and "Kashmir" while wanting to learn "Seven Nation Army" at the same time, Page never fails to have a twinkle in his eye from start to finish. 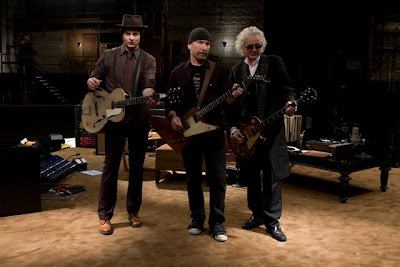 While Edge is naturally reserved to the point of stoicism at times-- cracking a rare but charming smile here or there-- and White's bravado feels both staged yet also earnest, it's Page who seems the most at ease. And as the guys reveal their various influences and play records both to us and to the camera, Page still can't help himself from engaging in an impromptu air-guitar session in his rec room as he rocks out to Link Wray's killer track "Rumble." Since Guggenheim's effort runs just under one hundred minutes, you'll want to move directly to the deleted scenes afterward where you may yourself wondering, as I did, why every single one of the cut moments weren't used in the movie as there's some truly amazing footage hidden in the special features. Because it is Sony after all, the excellence in both picture and sound quality is to be expected, complete with Sony's visual calibration Easter Egg, which ensures you have the best picture after you press 7669 on the main menu with your remote. Rounding out the disc with filmmaker commentary, and press conference footage, Blu-ray owners with BD-Live capabilities can also explore pop-up information during the film. And in a second exclusive BD feature, you're able to create and share your own play-list, which may definitely inspire you to whip out the air-guitar for a rock rebellion fueled by a "Whole Lotta [Guitar] Love."